Dimensions : 28 x 14 x 4 (LxWxH) mm. The X9C103 are digitally controlled (XDCP) potentiometers. Dc3v-5v X9c103s Digital Potentiometer consists of a resistor array, wiper switches, a control section, and non-volatile memory. The wiper position is controlled by a three-wire interface. The potentiometer is implemented by a resistor array composed of 99 resistive elements and a wiper switching network. Between each element and at either end are tap points accessible to the wiper terminal. The position of the wiper element is controlled by the CS, U/D, and INC inputs. The position of the wiper can be stored in non-volatile memory and then be recalled upon a subsequent power-up operation. The device can be used as a three-terminal potentiometer or as a two-terminal variable resistor in a wide variety of applications ranging from control to signal processing to parameter adjustment. 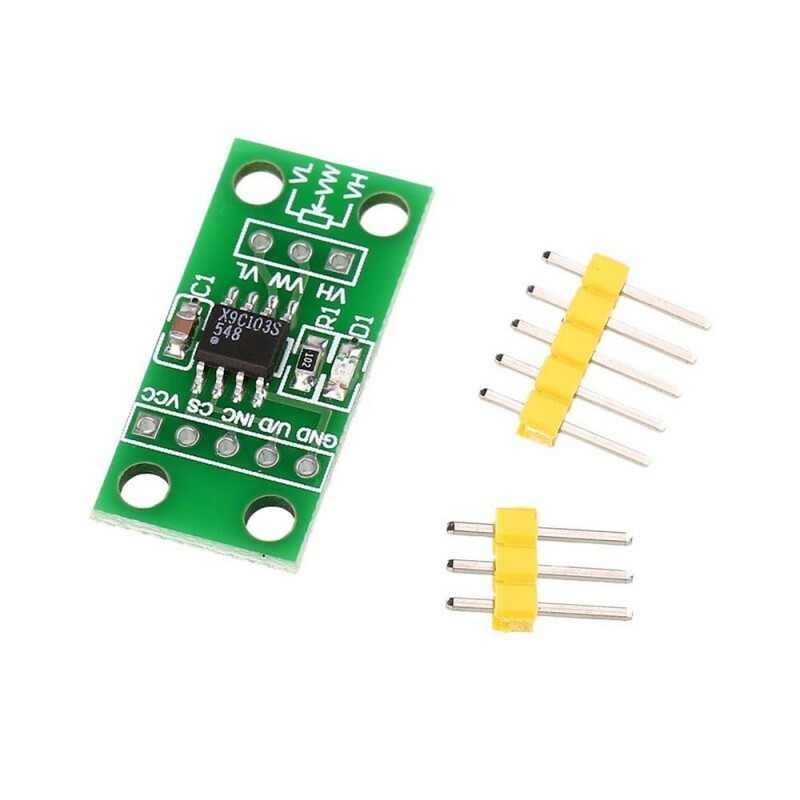 There are three sections of the Dc3v-5v X9c103s Digital Potentiometer as the input control, counter and decode section; the non-volatile memory; and the resistor array. The input control section operates just like an up/down counter. The output of this counter is decoded to turn on a single electronic switch connecting a point on the resistor array to the wiper output. Under the proper conditions, the contents of the counter can be stored in non-volatile memory and retained for future use. The resistor array is comprised of 99 individual resistors connected in series. At either end of the array and between each resistor is an electronic switch that transfers the potential at that point to the wiper. The wiper, when at either fixed terminal, acts like its mechanical equivalent and does not move beyond the last position. That is, the counter does not wrap around when clocked to either extreme. The electronic switches on the device operate in a “make-before-break” mode when the wiper changes tap positions. If the wiper is moved several positions, multiple taps are connected to the wiper for tIW (INC to VW/RW change). The RTOTAL value for the device can temporarily be reduced by a significant amount if the wiper is moved several positions. When the device is powered-down, the last wiper position stored will be maintained in the non-volatile memory. When power is restored, the contents of the memory are recalled and the wiper is reset to the value last stored. The internal charge pump allows a wide range of voltages (from -5V to 5V) applied to XDCP terminals yet given a onvenience of single power supply. The typical charge pump noise of 20mV at 850kHz should be taken in consideration when designing an application circuit. VL and VH digital potentiometer sliding rheostat port corresponding to the low-end and high-end, allowing the input voltage range -5V to + 5V.